Big news from Glen Coe is the outstanding first winter ascent of Satyr by Donald King and Andy Nelson on December 7. Satyr was first climbed in September 1973 by the great Sheffield-based climber Paul Nunn together with Jack Street and Jeff Morgan. They graded it Very Severe (the top Scottish grade at the time), but nowadays it is reckoned to be E1 5a. It is not as popular as the other rock routes on the cliff such as Scansor, Unicorn and Central Grooves, and is rarely climbed. Summer routes of this difficulty are now being targeted by an ever-increasing number of top level winter climbers, so it was no surprise to hear earlier this week that a team were working on a winter ascent of Satyr. Donald first attempted the route with Mike Pescod in late November. He returned with Andy on November 30 who climbed the very serious first pitch (thought to be worth IX,8 as a stand-alone pitch) before finishing up Central Buttress. The pair returned on December 5, and climbed Central Grooves to reach their high point on Satyr and then continued up this in two pitches to the top. The second pitch proved to be another demanding technical pitch. Donald and Andy returned once again two days later (December 7) and reclimbed the entire route to record the first winter ascent. Satyr was graded IX,9 and ranks alongside The Duel as one of the most difficult winter routes in Glen Coe. 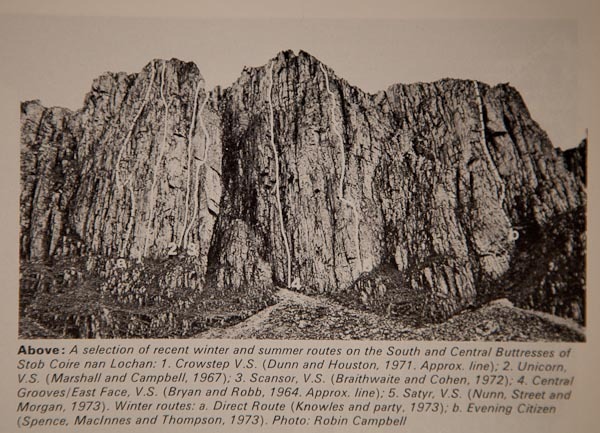 Stob Coire nan Lochan has clearly come a long way since Paul Nunn’s probings in the early 1970s! This entry was posted in New Routes, Topos and tagged Andy Nelson, Donald King, Stob Coire nan Lochan. Bookmark the permalink.